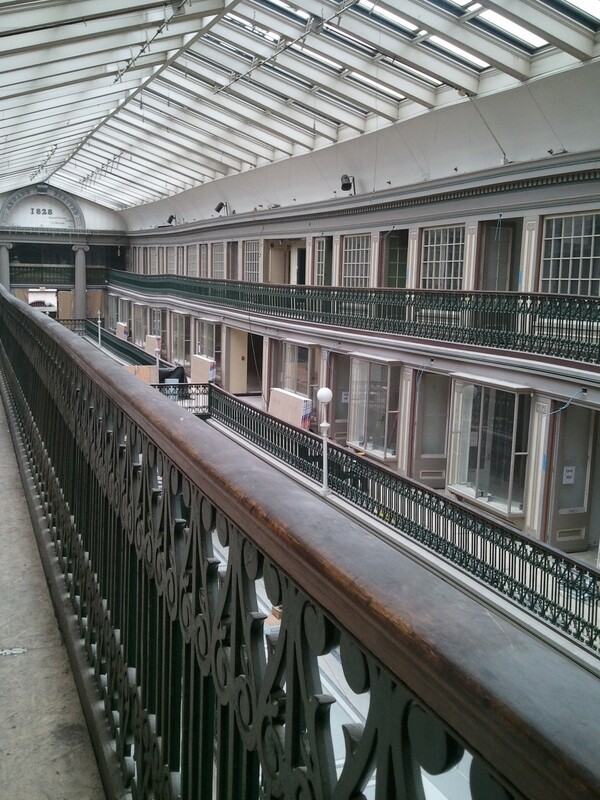 For months, everyone’s been talking about the transformation of the Arcade! Bright banners drape the facades announcing a new community of retail, restaurants and micro-lofts. Behind the construction fencing, owner Evan Granoff is converting the three-story historic landmark into a residential building with 14 retail units on the ground floor. According to plans, he expects tenants to move into the 48 micro-loft units in early 2013, possibly as soon as February. While the building is nearly 200 years old, this adaptive reuse is purely a new concept. Gaining in popularity in larger cities (with unaffordable rents), micro-lofts offer access to urban amenities at a reasonable price. At the Arcade, you’ll find furnished one bedroom units ranging in size from 225 to 450 square feet, complete with full bathrooms, built-in beds, seating and storage. Although they’re certainly not large, the kitchens are well equipped with refrigerators, sinks, dishwashers, and microwaves. When residents need more space than their cozy individual units offer, they can take advantage of a game room, TV room and porches. 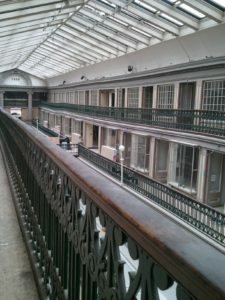 The Arcade has plenty of other common amenities: on-site laundry, bike storage, locked basement storage units, and a parking garage across the street. The ground level will soon be filled with a variety of single and double level retail shops. Four of the 14 units are designated for restaurants, offering private access, outdoor seating, and interior restrooms. The units average 400 square feet, but they may be combined for those who want more space. Interest is high, and space is limited. Find out more about Arcade retail opportunities here, and pay attention for leasing announcements soon! And if you’ve been eagerly awaiting your chance to live in one of Providence’s most notable landmarks, stop by to visit one of the almost-completed model units, or sign up for the Arcade’s waiting list! You can also stay in touch with the management team about their plans through Facebook and Twitter.